You might be surprised by how much high pressure shower heads can change your life. Seriously! In the morning, a good shower can start your day off on the right foot. At night, it can wash away the stress of the day and help you relax. If you’re looking for the best shower head for high pressure, we’ve done the research and found the best products. Before we get into the reviews, here are the features you should pay attention to. Finish Type - Whether you prefer something shiny, brushed, or even oiled and antiqued looking, there’s a high pressure shower head to match your taste. And your bathroom decor. There are plenty of options available to get the look that you want. Colors - You might be surprised at the range of color choices. Chrome, nickel, brass, bronze. Even white! Chances are there is a shower head out there that will match the other fixtures in your bathroom for a cohesive look. Number of Settings - Some high pressure shower heads have only 1 setting. Some have 5 or more. Do you need a lot of settings? Not necessarily. This is one feature that really just boils down to personal preference. Hand Held - Hand held shower heads are a great way to get a fuller massage experience. They also come in really handy for practical things, too, like washing your kids’ hair in the tub or even giving your dog a bath. Warranty - Just like with all warranties, the longer, the better. You can even find some high pressure shower heads that offer lifetime warranties! Just make sure you know what’s covered and what isn’t just in case any problems arise. Dimensions - Dimensions can vary greatly depending on the style shower head you choose. Just make sure it fits your shower! Generally, the larger the shower head itself is, the more nozzles it will have. And that means more coverage for you. We aren’t kidding. The best high pressure shower heads really can change your life. In fact, we’re a little sad our research is over because it was so relaxing! Now that you know the key features to look for in the best high pressure shower head, you can find one that works for you. If you’re in a hurry, make sure you check out our top and budget picks first. Now, let’s wash away any indecisiveness and get right to the reviews. Listen, if you want to pamper yourself, this is the way to do it. This is the best dual shower head - one is overhead, one hand held. If you use them together, you can choose from an astounding 24 different combinations. Each head has 5 settings, including: power rain, massage, stay-warm mist, water saving economy rain, and pause. Mix and match to find the perfect relaxing combination for you. The faces are 4-inches in diameter and provide a lot of coverage. And, if you can believe it, there’s more. It’s packed with features: rub-clean jets, 3-way water diverter, anti-swivel lock, adjustable overhead bracket. 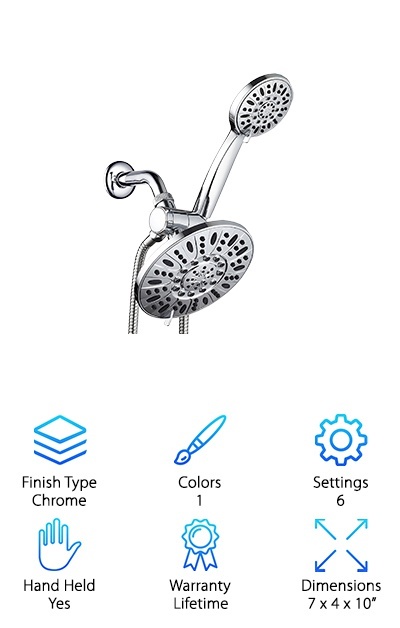 There are so many things that are adjustable with this showerhead. And check this out. Installation is tools-free and it even comes with plumber’s tape. Installing your new high pressure shower head could not be easier than it is with this one from Aqua Elegante. It’s so simple. All you do is twist off your old shower head and twist this one on. That’s it! 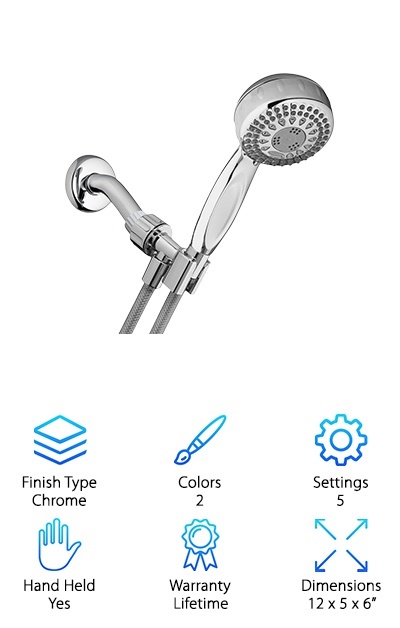 The connection between the spout and this shower head is made of brass that won’t crack, split, or corrode. The silicone nozzles prevent any hard water buildup so you won’t have to worry about losing water pressure over time. And just in case you want more pressure, the flow restrictors are designed to be easily removable so you can amp it up if you need to. It’s even available in 4 different finishes so you can easily match your existing bathroom decor. This is from the same line of Speakman shower heads that are found in fancy hotels around the world. Think about it: you can have the same experience in your own bathroom for less than it costs for one night in a fancy hotel with the exact same shower. It features 58 spray channels, including 8 massaging jets in the center. Adjust the flow with the T-turn handle through various settings, including full coverage, combination spray, gentle rain, and pulsating massage streams. Self-cleaning nozzles keep it low maintenance. Oh, and it prevents hard water buildup that can interfere with water flow over time. And don’t worry about installation, it’s so easy. All you do is remove your old shower and screw on your new Speakman and you’re ready to go. 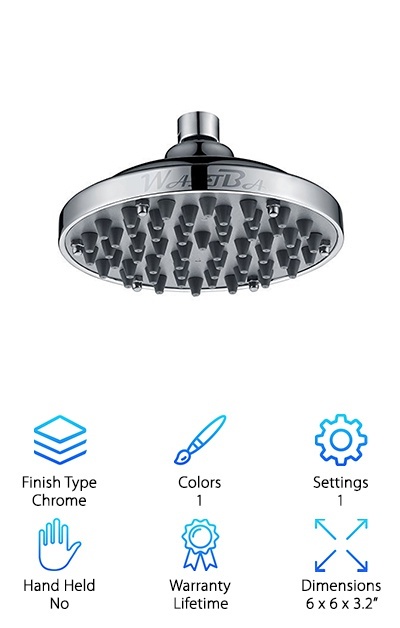 You can’t miss the most unique feature about this Wantba shower head. The huge face is 6 inches wide and covered with 57 high pressure jets. If you have low your water pressure is at home, this shower head can help maximize it. It’s so effective that you can get the same pressure as standard shower heads while using 70% less water! Installation couldn’t be easier - all you need is plumber’s tape. No special tools and nothing complicated. Rubber nozzles help prevent buildup and are simple to clean - simply wipe away any calcium and lime build up and you’re good. 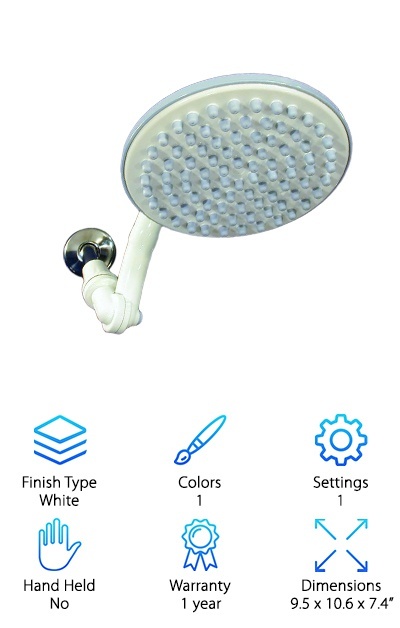 If you’re looking for the best high pressure rain shower head, take a closer look at Wantba. It only has one setting but you can be sure that they nailed it. 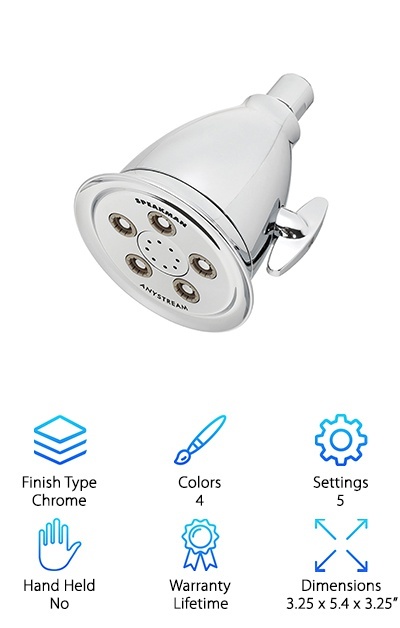 Another great choice from Aqua Elegante, this luxury shower head has 6 different settings: saturating power blast, pulsating massage, gentle rain, water saving, and two different mixed modes. The flow restrictor was designed to be removable. What does that mean? You can take it out and get even more pressure if you want it. Installation is super easy, you just screw it onto your existing plumbing. They even include plumber’s tape. Rubber nozzles mean easy cleaning and no hard water build up. The solid brass connector and ball joint resist corrosion and cracks. This means no leaking and long lasting durability. And in the off chance you don’t love it (though why wouldn’t you?!) the manufacturer offers a full money back guarantee for 5 years. 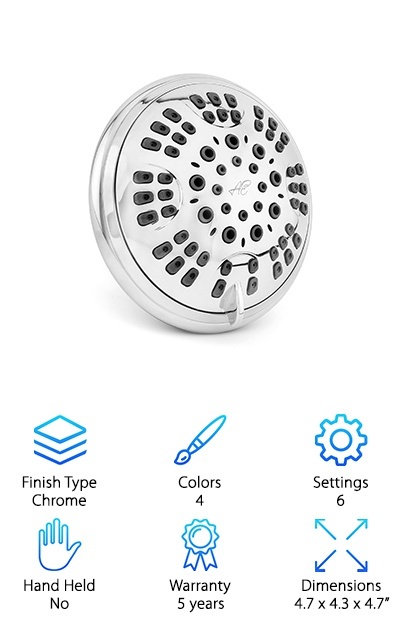 Did you say you want a shower head that’s even larger than the ones we’ve covered so far? You did? Well, here it is. This Luxe Shower Head is an astounded 8” wide. And check this out: it has 100 jets. 100 jets! With that much air infused water pouring over you, you’ll feel like you’re standing under a waterfall. The adjustable swivel lets you get the angle just right so no matter how tall you are, you’ll be able to find just the right position. The plastic nozzles mean it’s easy to clean and resists hard water buildup. Another good thing? Installation is super easy, twist it on in seconds and experience the best rain shower head with high pressure for yourself. 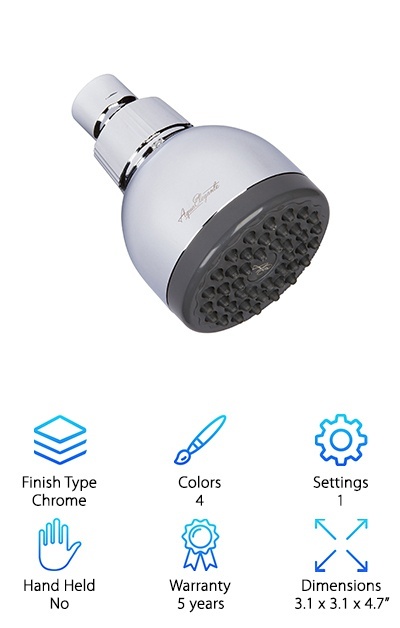 Waterpik is a well-known brand when it comes to shower heads and it should be. They’ve been in the business since 1974. This stylish design is engineered with OptoFLOW technology that gives you a powerful flow even with low water pressures. How does it work? It’s all about how it channels the water through the shower head. Choose from 5 settings to get the ultimate spa experience right in your home. It gets better. Not only is it hand held, it also has a 5 feet long hose. This makes it perfect for bathing the kids or even the dog because it has such a far reach. The anti-clog nozzles are easy to clean and don’t collect buildup. This shower head truly demonstrates why Waterpik has been a household name for decades. This AquaDance dual shower head is pretty impressive. The overhead rainfall shower head is an impressive 7 inches in diameter and provide impressive coverage. It has an adjustable angle, too, so it’s great for households with multiple people. The smaller handheld shower head is 4 inches in diameter and boasts an ergonomic handle for easy control. 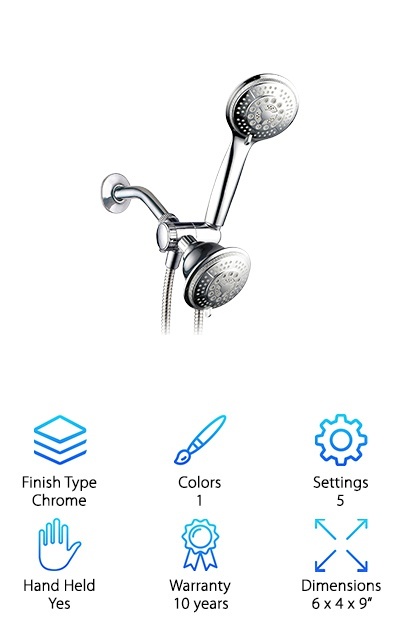 As for settings, you get 6 of them on each shower head: power rain, pulsating massage, power mist, rain massage, rain mist, and a water saving pause mode. Here’s the kicker: that gives you a combination of 30 different settings. Both shower heads have rub clean jets for easy maintenance and to keep the flow going strong. Installation is easy and only involves three connections that can be hand-tightened. They even include the washers and plumber’s tape. What’s cool about the Thunderhead Shower Head isn’t the head itself, although that’s pretty impressive. It’s 9 inches in diameter and covered with 90 jets. That means you get a full spray pattern that gives you complete coverage from shoulder to shoulder. That said, what’s really unique about this shower head is how many ways you can position it. The swivel arm had 4 self-locking joints. What does that mean? Practically unlimited positioning. There’s even a space saving mode that collapses the shower head close to the wall. The jets are made from soft rubber material that’s easy to clean and never clogs. 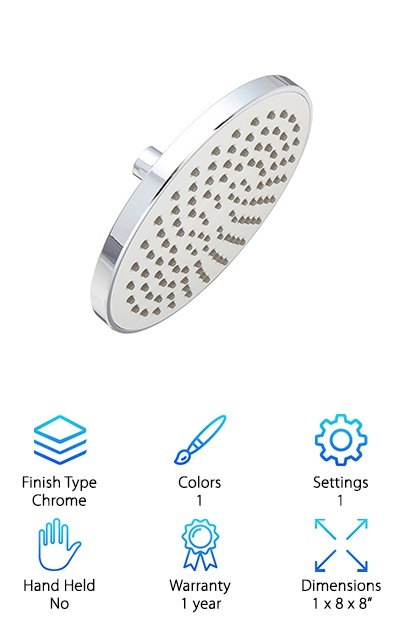 The finish on this shower head is interesting, too. It’s white, a bright neutral that matches any decor. If you’re looking for something that looks like more than your average shower head, the SR SUN RISE Shower Head will blow you away. Get this - it’s a wide, flat square. There are 64 silicone gel nozzles that are easy to clean and prevent buildup. Air injection technology gives consistent power that makes you feel like you’re showering in a rainstorm, even with low water pressure. Want to know the best part? Not only does it work well. It will truly be the focal point of your bathroom. 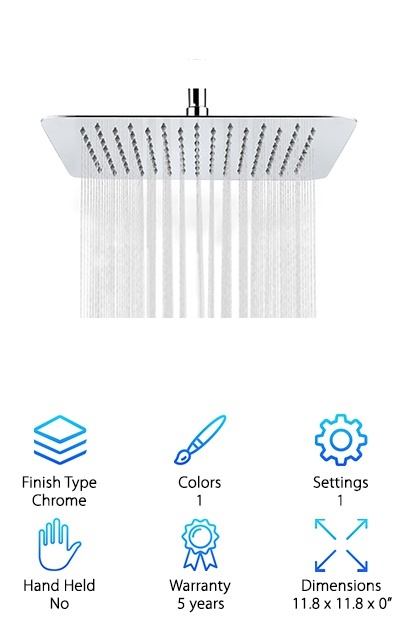 It literally looks like it’s raining in your shower. It will last a long time, too, because the finish is extremely durable. Why? It’s made of 10 layers of chrome plating. Oh, and Installation is easy, no tools required.